Vehicle Tracking System becomes very important now days, especially in case of stolen vehicles. If you have GPS system installed in your vehicle, you can track you Vehicle Location, and its helps police to track the Stolen Vehicles. Previously we have built similar project in which Location coordinates of Vehicle are sent on Cell Phone, check here ‘Arduino based Vehicle Tracker using GPS and GSM. Here we are building more advanced version of Vehicle Tracking System in which you can Track your Vehicle on Google Maps. In this project, we will send the location coordinates to the Local Server and you just need to open a ‘webpage’ on your computer or mobile, where you will find a Link to Google Maps with your Vehicles Location Coordinates. When you click on that link, it takes you on Google Maps, showing your vehicles location. 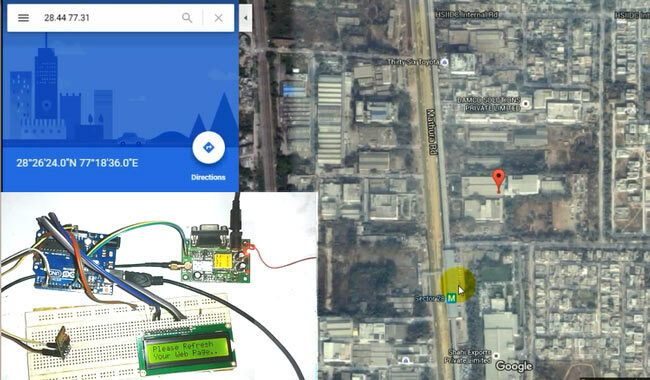 In this Vehicle Tracking System using Google Maps, GPS Module is used for getting the Location Coordinates, Wi-Fi module to keep send data to computer or mobile over Wi-Fi and Arduino is used to make GPS and Wi-Fi talk to each other. To track the vehicle, we need to find the Coordinates of Vehicle by using GPS module. GPS module communicates continuously with the satellite for getting coordinates. Then we need to send these coordinates from GPS to our Arduino by using UART. And then Arduino extract the required data from received data by GPS. Before this, Arduino sends command to Wi-Fi Module ESP8266 for configuring & connecting to the router and getting the IP address. After it Arduino initialize GPS for getting coordinates and the LCD shows a ‘Page Refresh message’. That means, user needs to refresh webpage. When user refreshes the webpage Arduino gets the GPS coordinates and sends the same to webpage (local server) over Wi-Fi, with some additional information and a Google maps link in it. Now by clicking this link user redirects to Google Maps with the coordinate and then he/she will get the Vehicle Current Location at the Red spot on the Google Maps. The whole process is properly shown in the Video at the end. Circuit for this ‘Vehicle Tracking using Google Maps project’ is very simple and we mainly need an Arduino UNO, GPS Module and ESP8266 Wi-Fi module. There is a 16x2 LCD optionally connected for displaying the status. This LCD is connected at 14-19 (A0-A5) Pins of Arduino. Here Tx pin of GPS module is directly connected to digital pin number 10 of Arduino. By using Software Serial Library here, we have allowed serial communication on pin 10 and 11, and made them Rx and Tx respectively and left the Rx pin of GPS Module open. By default Pin 0 and 1 of Arduino are used for serial communication but by using SoftwareSerial library, we can allow serial communication on other digital pins of the Arduino. 12 Volt adaptor is used to power the GPS Module. Go through here to learn “How to Use GPS with Arduino” and get the coordinates. ESP8266 has two LEDs, one is Red, for indicating Power and second is Blue that is Data Communication LED. Blue LED blinks when ESP sends some data via its Tx pin. Also, do not connect ESP to +5 volt supply otherwise your device may damage. Here in this project, we have selected 9600 baud rate for all the UART communications. Also check the Video at the end of this project, for detailed working process. GPS Module receives coordinates from satellite in Degree Minute format (ddmm.mmmm) and here we need Decimal Degree format for search the location on Google Maps. So first we need to convert coordinates from Degree Minute Format to Decimal Degree Format by using given formula. Suppose 2856.3465 (ddmm.mmmm) is the Latitude that we receive form the GPS Module. Now first two numbers are Degrees and remaining are Minutes. So 28 is degree and 56.3465 is minute. In this code, we have used SerialSoftware library to interface ESP8266 and GPS module with Arduino. Then we have defined different pins for both and initialize UART with 9600 baud rate. Also included LiquidCrystal Library for interface LCD with Arduino. SoftwareSerial Serial1(2,3); //make RX arduino line is pin 2, make TX arduino line is pin 3. After it, we need to define or declare variable and string for different purpose. Function for extracting data from GPS string and convert that data to decimal degree format from the decimal minute format, as explained earliar. Function for sending commands to ESP8266 for configuring and connecting it with WIFI. void show_coordinate() function for showing coordinate on the LCD and Serial Monitor and void get_ip() function for getting IP address. Void Send() function for creating a String of information that is to be sent to webpage using ESP8266 and void sendwebdata() Function for sending information string to webpage using UART. In void loop function Arduino continuously wait for request form webpage (Refreshing web page). Check the Full Code Below. You have said data will be uploaded to web via wifi module, however i think currently not all cars have internet wifi included inside! i meant isn't it better to keep on the gsm shield to drop data to the web ?? since you don't need the thief to go to wifi AP and update where is he? Yes that's a valid point. We we can change it accordingly. thanks! plz tell the gps serial name whether it is skg13bl or smethg else? Thanks pertaining to providing these sort of great details. U typed the IP address on the webpage ,which IP address is that? This is the IP address of Arduino, allotted by router/modem. I am courious i fyou have any idea if this would be moodable to log the entire trip and then upload the tripdata to a server when wifi was availiable? You can use ThingSpeak to upload and monitor your data online, check here to learn more. i have a GPS arduino Shield V1.2 does it works with this shield? First try to interface GSM with arduino, we have lot of projects with GSM and Arduino, check here. sir i am having problem while connecting esp 8266 d1 mini it doesnt have a ch pin and the serial monitor is giving error what to do??? I have run the code and viewed results on web browser using the assigned IP. but "Click Here for google map" link is not appeared in the browser. can you please let me know the changes need to be done??? i am getting error when i am compiling code. pls guide me. Please help me to improve the accuracy of the coordinates since they only indicate me to two decimal places on the serial monitor and I want them to indicate me more decimals. Here we have used "RoyalTek REB-1315S4" GPS module, but you can use any. Can I also monitor vehicle real data like speed, distance travel , temperature ,fuel level etc...through some addition ..? Can u tell me how? I am getting AT+CWMODE=3 ERROR. My LCD got stuck on ' WIFI Connecting..........'. Did you solve this, if yes? What is the solution? Can you please share it on the forum. Thanks in advance. this is my final year project, am confused how all these works- my project is like exact same but need be luggage instead of vehicle. For what you used a Wi-Fi Router ? how you use it ? Hi, What GPS Module model did you use? sir why we use wif module rather than gprs,,, what is the difference ....? so you ar sending data from arduino to local ip ! ok but you can not do the tracking if you do not send data to public ip ! maby we can just send data to email and read from there ..what you think saddam khan ? My Name Is Shah Amar .And I would like to know about The Which Model Is Always Use for Gps Module? QQ: Is it possible to send the gps data to a cloud endpoint with authentication and bearer over https.? if yes, can you please give some pointers..
Hello, I am using XAMPP localhost as my web server. Does this work with localhost address 127.0.0.1? Great Work!! But can u track real time moving location of that vehicle or anything. I have connected the hardware as shown in the article and uploaded the code as it is. I am getting compile time error as - can anybody help with this? While uploading code in Arduino, do we have to keep ESP8266 in program mode, or are there any other settings, I am getting errors in the serial monitor. ESP8266 is not getting connected. Getting stuck at GETTING IP address. What is the porpuse of router? Is it possible that if don't have a router used, can't connect to the google maps? Same here,please help me if you have resolved your issue. and As per my obersevation in your code, your not using any AT commands for GPS with power ON of your GPS(AT+CGPSPWR=1) how that will work. it is my doubt please solve this, Thank you in advance. Is wifi necessary for this project.Can i use mobile`s data for that purpose? I am really glad that you responded for my message,brother i am stuck in "getting iP" line. I am not getting IP address of wifi module on serial monitor screen. kindly help me,i am running exactly the same code provided here except the Baud rate which i changed to 115200 instead of 9600 because my wifi module does not connect to home wifi router at 9600 baud rate. if it is possibal to send trackre data to aprs web in place fo googl map?